Sheet drains are an ideal drainage solution for foundation walls, behind retaining walls and in green roof applications. The dimple drainage structure allows for a high flow rate while an outer layer of permeable geotextile prevents debris from entering the drainage channel. The combination of installation and the materials are a great deal less expensive than aggregated drains when labor is factored in. Typically, sheet drains weigh less than 5 oz per square foot, are easy to manipulate so you can place sheet drains quickly and easily. You do not need high-end skills or heavy equipment to install and due to their light weight are also easy to transport. Sheet drains are designed to provide excellent flow capacity. They are thin, lightweight prefabricated drains that are far superior to several feet of stone as used in traditional drainage systems. Because their overall thickness is only 1/4” to 1-inch, there is minimum excavation needed to install the systems. The open area for collecting water in a prefabricated drain is between 65% to 85% which is superior to perforated pipe only offering 3% to 5%. This drain provides a faster and higher volume of water collection for below grade applications. Prefabricated drains are better and more efficient for sub-surface drainage operations. Because filter fabrics allow for a higher volume of water to enter, while keeping back fine soil particles, there is a greater reduction in clogging. With good filtration elements and a high percentage of open areas for water, there will be less clogging and possible drainage failure. Prefabricated drains are designed to meet consistent and individually confirmed performance attributes, guaranteeing anticipated performance. A formed core provides a good surface adhesion for shotcrete and other construction materials. The Polymeric core is impenetrable to water. Water seepage to the structure is minimal and allows for an extended life expectancy for the waterproofing membranes. Sheet drains have the strength to prevent crushing of the core, resisting damage during installation. The strength of the fabric will guarantee minimal tearing or puncturing during normal backfill situations. Visibility of the material and installation is very easy during an inspection and less time consuming than other drainage methods. The core thickness will dictate the product's flow capacity. We offer three basic drainage cores. The flow rates are calculated in gallons per minute, per LF. 0.25 inches (6.35mm) core provides maximum flow capacity of 13 gpm. 0.44 inches (11.0mm) core provides a maximum flow capacity of 22 gpm. 1.0 inches (25.0mm) core provides a maximum flow of 80 gpm. 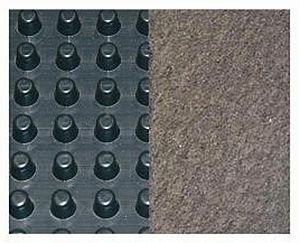 The monofilament filter fabric offers a superior strength and filtration for pouring concrete and organic soil operations. It is highly recommended for certain horizontal applications as well. We offer a wide range of prefabricated drains with filter fabrics that meet most specifications for subsurface drainage. The polymeric dimpled core serves as a pipe and will create a flow channel for collected water. It also provides additional strength to withstand load demands from soil and other surface pressures. The compression strength typically ranges from 5,200 lbs per square feet to 45,000 lbs per square feet. The core height typically ranges from 0.25 inches to 0.44 inches. The height determines the amount of water that can be collected and transported. The flow capacity of sheet core products range from 9 to 22 gallons per minute for each foot of the product's width. It would take several feet of stone to duplicate the flow capacity produced by these low profile cores. Dimpled core works as a protection course. 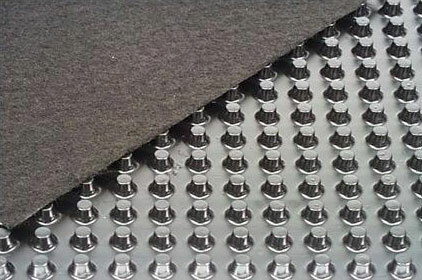 The core is impenetrable, therefore, sheet drains can replace using protection board against waterproofing membranes. Further membrane protection is achieved with sheet products constructed with polymeric film bonded to the flat side of the core. This filter fabric will prevent the trespassing of soil particle into the drainage core. This fabric provides a large open space for water collection and creating a more efficient way of water collection for sub-surface drainage operations. This allows for water to quickly enter the drainage core and reduce clogging. The geosynthetic fabric is securely bonded to each dimple of the polymeric core to prevent soil intervention. Our sheet drains are constructed with a wide range of filter fabrics to address the most challenging soil conditions you might run into. When you need to get the job done right the first time, contact us and get the sheet drain products that works best for your drainage product.